Three Centuries of American Prints: from the National Gallery of Art, National Gallery of Art, Washington; National Gallery in Prague, Prague 1; Antiguo Colegio de San Ildefonso, Mexico City; Dallas Museum of Art, Dallas, 2016 - 2017, no. 90. Sasowsky, Norman. 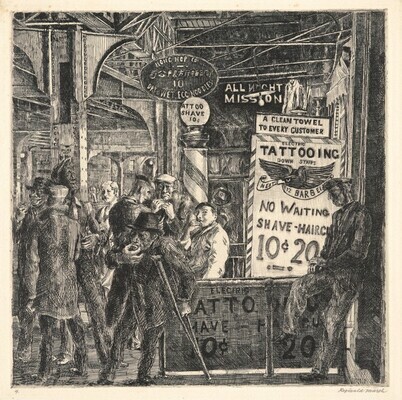 The Prints of Reginald Marsh. New York: Clarkson N. Potter, 1976, no. 140.